Nexternal excels in the area of order management. Spending less time fulfilling orders saves time and money. It also means you are able to allocate more resources to sales and marketing. With most ecommerce systems, orders that are received must be input to the shipping carrier's software for label creation. This is often done via data entry or by manually executing order data exports and imports. The bottom line is that it takes time and is prone to error. With Nexternal's Order Management System, merchants can create labels with the click of a button. It's that simple. Online sales have grown significantly over the past few years. For many merchants, processing orders one at a time can be laborious. 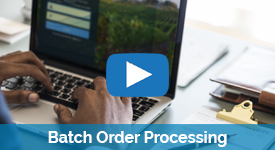 Fortunately, Nexternal's software includes a batch order processing tool. Merchants can capture funds for a grouping of orders and create shipping labels all in one fell swoop. This is a must-have for merchants doing more than 20 orders per day. Nexternal has integrated with several payment gateways to offer online credit card processing. With the click of a button, a payment can be captured. Nexternal's transaction terminal eliminates the need to log in to a separate virtual terminal. With Nexternal's ecommerce software, there is no need to create invoices and packing slips in other systems. From each order detail screen, merchants can create both of these. When processing orders in batch, these can be printed in bulk. Nexternal's software integrates with QuickBooks, a popular account system. For merchants using other legacy accounting systems, Nexternal offers a set of XML tools. These tools can be used to query order data from Nexternal's system in real time. Nexternal comes equipped with a tool that automates the drop shipping process. It's an end-to-end module where by every party in the transaction receives communication electronically. Emails are automatically sent to drop ship vendors notifying of the products that they need to ship. These vendors can log in and update orders statuses and enter tracking numbers. Once updated, the customer and retailer are emailed a notification. Everyone is kept in the loop automatically. Time is money. Nexternal's order management system saves merchants time and leads to a more profitable online retail operation. To learn more about how Nexternal's software decreases fulfillment costs, please give us a call at 800-914-6161.